Kids of all ages love remote-controlled toys, so a train makes the perfect gift for children who are looking for a new RC vehicle. There is a range of products aimed at kids of all ages from toddlers right up to teens, and we have chosen a selection of different age groups to review here. There are standalone trains available which can be used with other tracks your child already has, or you can choose a full set which includes the train, remote, tracks and some accessories – great for starting a collection. We’ve also included a few festive models, which are great for setting up around the base of the Christmas tree to make the holiday season even more magical. Kids will love the excitement of getting their train set out every year, mastering how to build it and how to control the train. There are a few things you might like to consider when searching for the perfect remote control train for your child. There is such a wide choice available that it can be difficult to know what best suits your child’s needs and ability. You should think about what train toys your child might already have when choosing a new RC train set for them. Some products are compatible with other sets so you might wish to choose from the same range to build up a collection. It’s also a good idea to consider your child’s skills and abilities, to choose something which is neither too easy nor difficult for them to operate. It’s a good idea to choose a remote-controlled toy which is slightly challenging for your child, so they don’t get bored quickly. Before choosing a train which comes with tracks, think about where you plan to build it. Some tracks can take up quite a lot of space so make sure you will be able to lay the track out fully. It might be a good idea to get a train table for your child to build their tracks on, so they won’t get damaged or get in the way. This radio-controlled train is a great pick for those who already have a wooden railway set. It is compatible with any standard wooden train tracks, so you don’t need to buy anything special if your kid already has a train collection. It’s great for adding something different to your toddler’s railway – perfect to keep them entertained as they grow older and more able to operate new toys. The set is perfect for siblings, as there are two frequencies meaning you can run two engines at the same time. The control is very easy to use as long as there is a clear line of sight. There is also a button to switch the headlights on, and one to make the engine play realistic sounds. These fun features are sure to keep your toddler entertained for hours. This easy-to-use RC train is great for all fans of the popular cartoon. It is great for kids aged around 2 years old and above, thanks to the simple remote. There is a button for forwards and one for reverse which also turns the train, making it really quick and easy to master. Thomas the train also puffs out real steam, sure to delight and amaze your toddler! Parents will be glad to know the steam is cool and therefore completely safe for your child to touch. He also plays sound effects and says phrases from the program to add to the fun. It’s a good idea to buy some rechargeable batteries and a charger, as the train takes 4 AA batteries and the remote requires 3 AAA batteries. You’re sure to get through them quickly – your toddler will never want to stop playing with their new train! 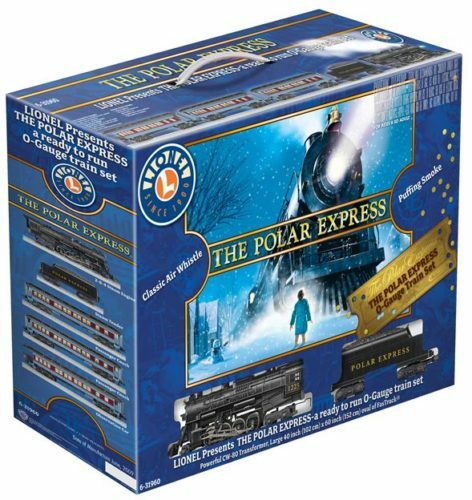 This beautiful train set would make a perfect Christmas gift for a special boy or girl. It will look great set up during the festive season – it’s possible to purchase extra characters and figures to make a stunning display. The engine plays sounds such as the whistleblowing or the bell ringing, as well as phrases from the film. The train also features a working headlight, and you can see the shadows of the children sitting inside the cars. There are 24 curved pieces and 8 straight pieces to allow your child to create a variety of layouts. The track measures an impressive 50 by 70 inches when set out in an oval shape, so make sure you have enough space to set it up! The remote is easy to use, making this Polar Express model a hit with young children and adults alike. 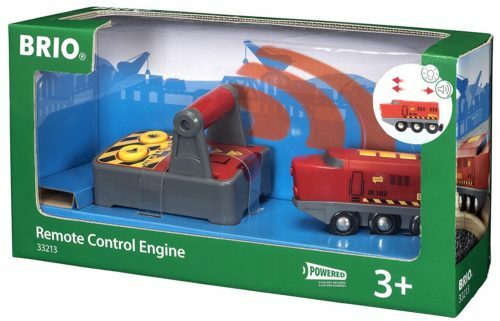 This remote control train set is perfect for children aged around 4 and above. It comes with everything you need to get started, including the train and the controller as well as enough track to make a 45 by 55-inch oval, some figures to drive the train and some cargo containers to load on the back. The set works well with other Playmobil toys, enabling your child to create a whole city of their own. This set is great for encouraging your child to use their imagination, and it is also ideal for helping improve physical development. Your child will have years of enjoyment with this toy, and it is so strong and durable it will remain in great condition no matter how much it is played with. 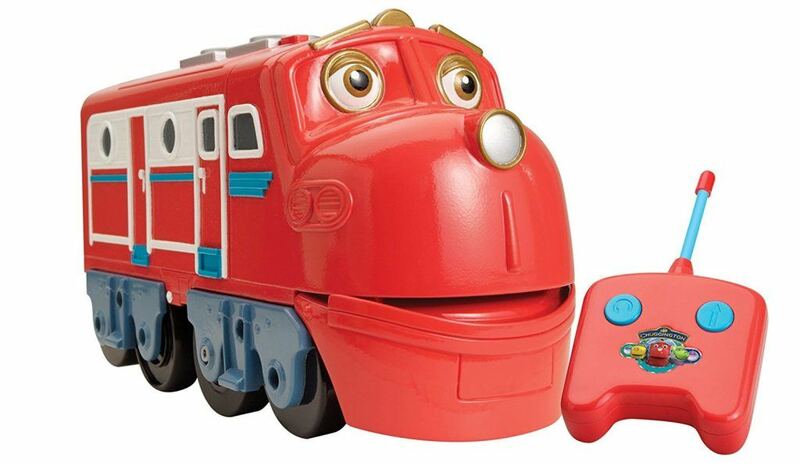 The controller is a bit more difficult to use than some other RC train toys, and there are also some small parts of the toy, making it ideal for slightly older children rather than toddlers. This is a great introduction to remote-controlled vehicles for your toddler. They are sure to love the friendly character and will be able to learn how to operate the toy quickly, thanks to the simple controls. There is one button to go forward and another to make the train spin, so children as young as 2 years old can quickly learn how to use it. The Chuggington Wilson train runs well on most surfaces – it doesn’t require any tracks. There is only one frequency so two of the trains can’t be used together, however, there are other characters available which operate at different frequencies. The train can be used as a push along toy when it is switched off, giving your toddler two ways to play. 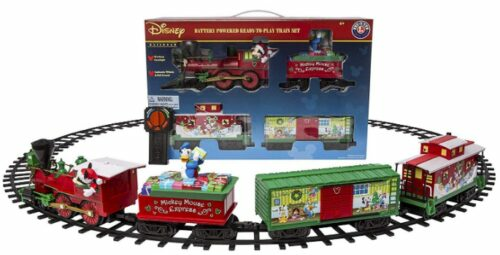 This Disney-themed train set is perfect for decorating your family room for the holidays. It is the perfect size to go around the base of a large Christmas tree. The train would make a great Christmas gift for any young Disney fan. The Mickey Mouse train has loads of fun features – there are a working headlight and the buttons on the remote to make the engine play realistic sounds, as well as Disney-themed phrases. Young children will love to watch their favorite characters going round on the train. They will love driving it too – the remote is easy to use for young conductors! This is a great set for older children who are looking for a challenge. It is recommended for children ages 12 years old and above. Building a LEGO kit is a great activity for parents to help children with – it’s the perfect way to spend quality time together. The set includes 5 minifigures, and plenty accessories to go with the train – your child can let their imagination run wild! The train isn’t motorized but it’s possible to purchase accessories to make it remote-controllable. The diameter of the track is over 27 inches and the train is around 20 inches long. There are over 700 pieces in the kit, including 16 track pieces. Kids will love building the railway every Christmas – it is a great tradition to start. This fun railway set is perfect for 2-year-olds. It comes with everything your toddler needs to set up their very own village railway, including bridges, tunnels, and a train station. The train also plays sound effects to add to the fun for your little one. Even young train lovers will be able to use this Fisher-Price toy – the train can also be pushed along the tracks if your little one can’t yet use the remote. The tracks are easily clicked together, allowing for many different layouts to be created. This is great for stimulating your little one’s imagination as well as developing fine motor skills. Your toddler will also be gaining problem-solving skills as they work out the best ways to lay out the track to make it join up. This set is a great starting place for building a collection of GeoTrax toys. The car tracks are also compatible with this set, so your child can build elaborate layouts as they get older. Therefore, this set makes a great gift – family and friends can add to the collection for birthdays or at Christmas, to make choosing the perfect present easy! 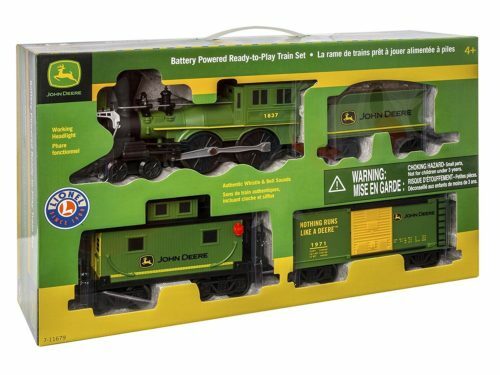 This is a great ready-to-play radio controlled train set which is perfect for young farmers. 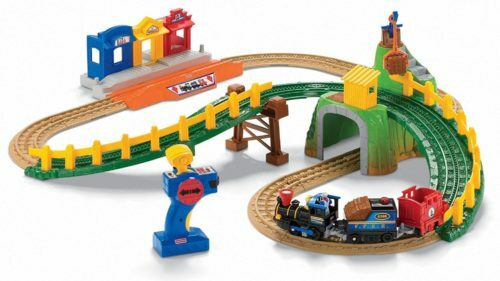 The train features an engine and three cars, and the set also comes with plenty of track. The track measures around 50 by 75 inches when set up in an oval arrangement, so your child is sure to have hours of fun. There is a mix of straight and curved tracks, enabling your child to create a variety of arrangements. They will love to set up their very own farm and transport their equipment on the train! The controller is easy to use, making it perfect for even the youngest train drivers. There are buttons which sound the whistle and ring the bell, as well as making the train play announcements. Parents will be glad to know the sounds are not too loud or irritating – everyone will enjoy using this railway set over and over again. The train also has a headlight – your child will love watching the train go around in the dark, too! The train runs well on a variety of surfaces – it stays on the track well on both hard floors and carpet. 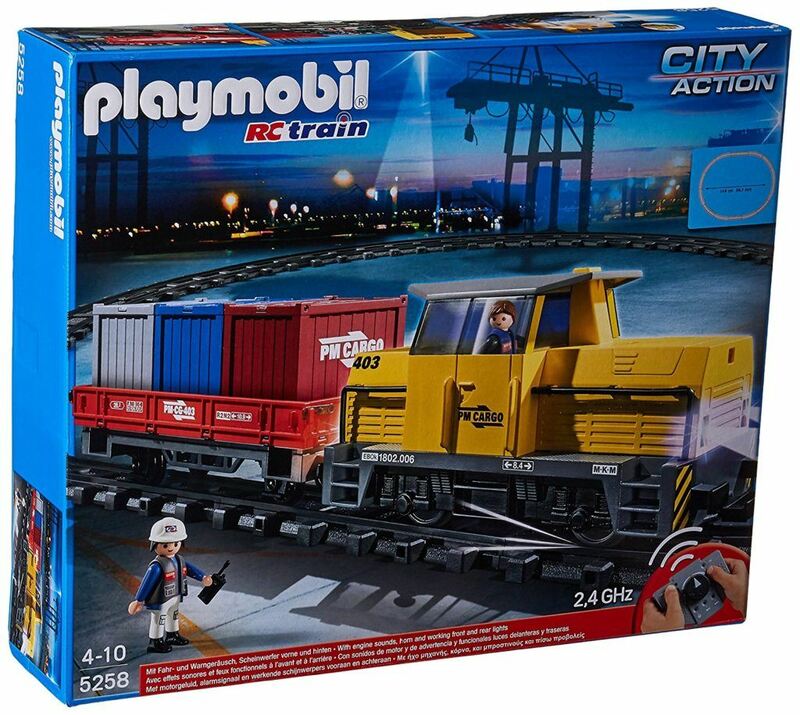 For those looking for the very best RC train for their child, the Playmobil City Action Freight Train is the perfect pick. It is compatible with other sets, meaning your child can build their very own town. The train offers great learning opportunities to your children such as problem-solving, imaginative play and motor skills. Kids of all ages will love playing with this set over and over again, and parents will enjoy joining in and helping create different scenarios. If you want a remote-controlled train which will entertain your child for years to come, this set is a must-have. For radio-controlled fun on a budget, the BRIO engine is the ideal choice. It can be used with a huge range of train sets – it’s likely your child already has something it will work with. The toy is really easy to use, meaning it’s perfect for toddlers, but it is interesting enough to keep older kids entertained, too. The train can travel forwards and backward, and also features sounds and lights which really adds to the excitement. There are two frequencies on the train, meaning it’s great for siblings or friends to play together. Your child will have years of fun with this engine, making it excellent value for money.